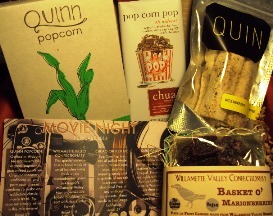 My Portland Tasting Box from Foodzie Arrived! I received my shipping notification yesterday afternoon, so imagine my surprise when the shipping notification indicated that the package was actually out for delivery! Yay! I ended up getting this package much earlier than I expected because I hadn’t gotten my notification … it might be nice if Foodzie delayed the notifications like this in the future, that way I’m not constantly and impatiently checking the tracking to see when it will arrive! The three box themes that we could select from this month were: Portland Box, Spring Brunch Box, and Some Like it Hot Box. I was really tempted by the Some Like it Hot Box (I LOVE spicy food! 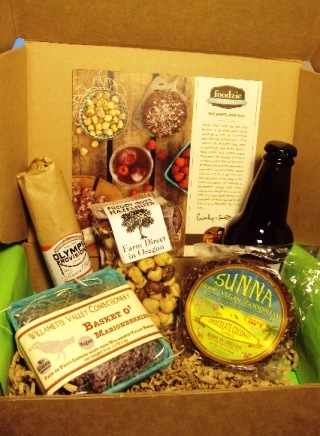 ), and I would have selected it if not for the Portland Box. I mean, come on! I’m Hungry in Portland! You know I’ve got to choose the box that represents my beloved city! OK, yeah, so I actually live in Vancouver, but Portland is right over there. Like, a five minute drive. And usually when I go out to eat, it’s in Portland, and really, I doubt Foodzie will ever have a Vancouver, Washington box … because typically when someone mentions “Vancouver” … people think Canada, not Washington state. And you know what? Surprisingly enough, even though I live there (or very close to “there”), these are all foods I’ve not yet tried! Inside this month’s box, I received a bottle of Raspberry Soda from Hotlips Soda, a package of Roasted Hazelnuts from Freddy Guys, a Chocolate Coconut Cookie from Sunna’s Cookies, Cacciatore salami from Olympic Provisions, and Marionberry Pâte de Fruit from Willamette Valley Confectionery that’s been packaged in a cute produce basket. I am really excited to start tasting from this box! YUM!